We are open 10am to 11pm every day. Check-ins are any time after 3pm up to 11pm, and check outs are at 11am. Upon closing at 11pm we do not take any reservations, payments, or rent any rooms until 10am when we reopen. We accept Visa, MasterCard, Discover and American Express for payment. 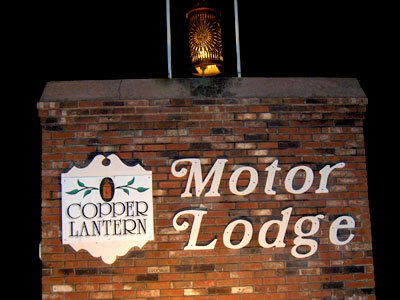 Thank you for visiting the website of the Copper Lantern Motor Lodge in West Brookfield, Massachusetts. We provide a variety of motel rooms at reasonable rates for lodgers visiting the rich culture and natural splendor of Central Massachusetts. We serve towns in the area including: Sturbridge, Brimfield, Barre, Rutland, Hardwick, Brookfield, West Brookfield, North Brookfield, Ware, Warren, Spencer, Palmer, Fiskdale, East Brookfield and Gilbertville. We are in the vicinity of the State Police Academy, Camp Atwater and the Eagle Hill School.